Wow I can’t believe the year has passed so quickly. We were JUST preparing sohoor like two weeks ago! Anyways so let’s talk business. It’s Day One of our 30-Day Ramadan Challenge, and I was thinking what’s the BEST thing to start this Holy month with? “My people (Ummah) are granted five gifts that no prophet before me had been given. First, when it is the first night of Ramadan, Allah looks at His servants. He will never punish those at whom He looks. Second, the smell of their mouths when night approaches is more pleasant [to Allah] than the scent of musk. Third, angels seek Allah’s forgiveness for them everyday and night. Tonight, the first night of Ramadan, we close the door to the past, take a deep breath and open the door to the blessings of new beginnings…. Take a moment to absorb the magnitude of this Holy month. Do you know how many Muslims died last week? LAST WEEK! They missed this chance, but you didn’t. You were chosen to witness this special night, where Allah looks at His slaves, and if they’re in a state of submission or worship, that alone is a sure ticket to Paradise inshAllah. The first night is singled out from all the other nights. Don’t miss it. Trust me, nothing can be more important. Make a long heartfelt sujood (prostration) with full submission, and ask Allah to purify your intentions for this Holy month. Make two raka’s (what’s a rak’a in English?) before that long beautiful sujood. Thank Allah for being here, ask Him to guide and help you, pray for those who couldn’t be here this year, and end with a note of gratefulness for all the blessings we take for granted. Let’s take like FULL advantage of it. This entry was posted in Ramadan Is Here and tagged actsofkindness, Allah, day, faith, first night, friends, gooddeeds, hadith, holy, inspiration, islam, kind, love, mecca, month, mosque, muslims, pray, quran, Ramadan, ramadanchallenge, sujood, taraweeh on May 26, 2017 by LillyS.Mohsen. Episode One: It’s An Inside Job! Thundering slamming sounds of doors locking. Roaring noises of steel chains clatter together. And the golden gates are opened, filling the universe with the sparkling scents of Heaven…. People from all around the world gather together, excited and anxious to be amongst the frontrunners. From every race, age and color, the chosen contestants hold hands in peace; awaiting further reminders before they head off for the big win. All the organs take their seats, giving full attention to the Heart that stands up and speaks first. “Hey! What did I do?” The Brain looks innocently confused. Lungs: Good news! Fasting helps remove built up toxins there. This month is for us to literally take a ‘breather’. Stomach: Will be using the foodless and waterless hours to work on removing any waste matter and allowing for better digestions. Good luck! Blood vessels: Since less blood will flow to the digestive system, more blood will go to other tissues, removing the cholesterol lining in our blood vessels. Well, about time! Intestines: Like the stomach, will finally use this period for detoxification. Kidneys: Will absorb more salt and water, which will help stabilize blood pressure, improve the organ’s functions and avoid kidney stones. Congratulations! Complexion: While fasting, the body has free time to focus on its regenerative energies on other systems like clearing up skin, sweat glands and preventing acne. Yeah that’s why we glow in Ramadan. Liver: Reserved ‘Glycogen’ in the liver will be broken into glucose, which all of us organs can use as extra fuel or energy. Thanks pal! We owe you one. Body Fat: When the supply of glycogen runs out, we turn to stored body fat, breaking it into fatty acids and converting that to useable energy. Let’s lose some of that stubborn weight this summer guys! Brain: Fasting boosts the levels of serotonin, the ‘happy hormone’ that beats depression. It also enhances the production of proteins that activate brain stem cells, promotes brain functions, and protects it from diseases such as Alzheimer’s. We’re all counting on you this month dude! “Ouch! Horrible Headache! Ahhhhh this really hurts!” The Brain screams as loud sirens shake the room. Attention! Brace yourself while system resets. I repeat. All organs brace yourselves. This Is An Automated message. 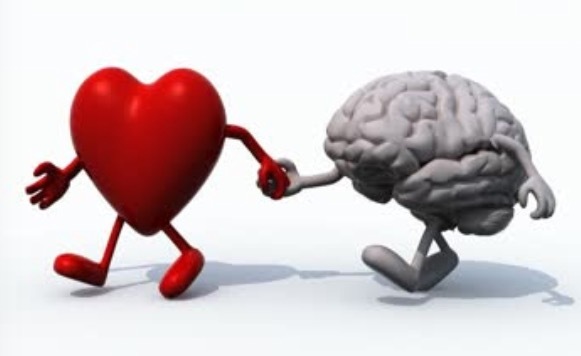 The Heart puts its hand on the Brain’s shoulder and speaks softly. “I want pain killers, coffee, sweets, anything! Please!” The Brain holds its head. Increased focus, mental clarity and creativity. Fasting is a powerful tool in maintaining a healthy mental state through clearing out suppressed ‘emotional baggage’. Controlling impulsive urges which enhances wisdom. Fasting improves quality of sleep. Ultimate awareness and living the ‘now’ helps you feel the ‘joy’. Strengthening your will and inner power. “Oh you’re so sweet. How come we don’t spend more time together? Listening to you is really soothing… You’re so pure and genuine!” The Brain smiles. Dressed in a sheer white suit, the ‘Inner Being’ welcomes each organ with a rose. The sound of Qur’an in the background fills the room with tranquility. After the recitation is done, the ‘Soul’ stands up and asks the audience to close their eyes. The body starts to feel lighter, senses are heightened and our beliefs and principles are crystalized. It’s Allah’s pleasure we are seeking. This is the chance to embrace your new beginning. For even those with the worst past can create the best future. The energies of the universe are bright and colorful in Ramadan. Your aura is cleansed and activated. Polish the mirror of your heart to reflect the ‘Divine Light’. Feel the presence of your Lord and the angels around guarding you and recording your deeds. Allow yourself to absorb this month’s blessed glory. Hmmmmm…I run quickly to fetch the blueprints for the next phase of the race and I chuckle with amusement! Episode Two: ‘Joy Is A Six-Letter Word’. Coming right up…. Stay tuned. This entry was posted in Ramadan Is Here and tagged amazing, blessings, brain, cancer, episode, facebook, faith, family, fasting, friends, glowing, happiness, headache, health, heart, holy, insidejob, islam, job, joy, love, lungs, mental, month, organs, race, Ramadan, skin, spiritual on June 26, 2015 by LillyS.Mohsen.